Held over for a second month at the Edward Jones/Joe LoMonaco gallery (51 Main St., Brattleboro) is Barbara Merfeld-Campman's show of assemblages, monotypes, monoprints, and paintings. This is the artist's first solo show in the area. Merfeld-Campman calls the exhibit a "mini-retrospective" as work goes back seven years with an assemblage entitled Beloved, a work created for her grandchild, to prints finished just before the show was hung. The artist is widely known and hailed locally as co-founder of the River Gallery School with the late Ric Campman, then her husband. That was 1976. She has continued to teach at the school ever since. 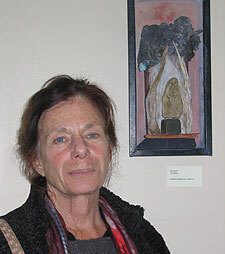 Barbara stands by her "Shrine" assemblage in the current exhibit. Merfeld-Campman recently spoke to me about her journey of becoming an artist, "a long, slow journey" to a place that she feels she has arrived at only in the last few years. Merfeld-Campman met Ric Campman when she was only seventeen. "When I was in New York, my closest companions were very committed male artists -- they all seemed wonderfully confident!" She continued, "My entourage has always been very male, even friends when I was growing up. I wondered, 'Where do I fit in?' Our friends were deeply passionate about abstract expressionism. I loved the abstract expressionist artists (that my friends were excited about) but I also loved artists that didn't fit into that picture like Kandinsky, Chagall, Miro, and Bonnard." During the years on the farm, Merfeld-Campman says she used the play space the family had for the children as a studio. "I worked late at night, after the children had gone to bed." She put her work away in drawers. It was not until she joined the Windham Art Gallery (WAG) cooperative that she showed any work to the public, "and then I always asked for a back wall." 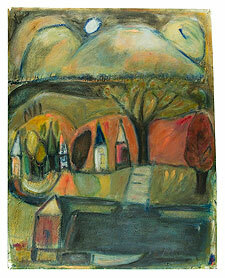 Some years ago she had "a powerful dream" that pointed the way toward fully inhabiting her artist self. "I needed to create my own vessel where the alchemy could take place. I didn't show then for a while. I dropped out of WAG because I needed to experience the purity of the exploration. It shocked me -- the idea that I had to seal myself and my art off to find my own way." 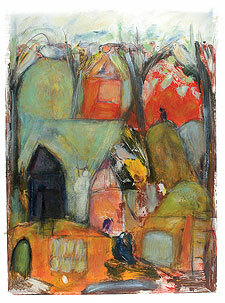 Eleven years ago she started teaching the "Art and Meditation" class at the River Gallery School. Says Merfeld-Campman, it changed her. "I started being able to put all my selves together. My spiritual life has always been very important to me. I had a whole other group of friends around that. How can this come together with my art? I came to see they both tap into the same creative source." "Over the years, what seemed like all these separate parts of my life that I loved started to come together as one, like an assemblage. The whole issue of what is my path is not an issue any more. I don't have to say it now: I am an artist. Though I also need all these other things -- the children, the soil ... I do miss the animals -- but I don't have the energy!" This is a story that will be familiar to many women artists, whether the dilemma resolves itself as profoundly as it has for Merfeld-Campman, or not. She has made it her mission to help others -- often women -- through those barriers to self-expression. "It's been a very long process of feeling comfortable putting my work out there," she said. "My work is very personal and intimate. There is something about showing it that, for me, is not easy." Noting the irony, she added, "The way I teach is to encourage personal expression. It is what I am always telling my students -- to take risks, don't be afraid to express yourself. I guess we teach what we need to learn for ourselves. And it helps me, seeing how brave my students are." This is the first time, she says, that she has felt truly supported in putting a show together. "I had a group of women who hung the show, made labels. It really felt great." In this artist's imagery, dories become cradles, seaside houses become magic houses. The ocean is, asserts Merfeld-Campman, very important in her life and her work. 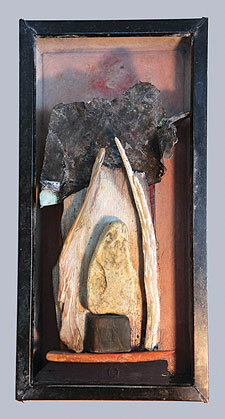 The assemblages too, while having titles like "Bird Caboose" or "Skeins," are often made from driftwood and pieces of washed-on-shore metal, sometimes from detritus collected years ago when she and Ric and the children went to Swan Island, Maine, for vacation. And like the ocean, Merfeld-Campman's prints and assemblages can feel like portals into dreams or reveries, the subtle imagery not pulling you in but rather inviting you -- respectfully, graciously -- to share in her rich inner world. A world infused with bright yellows and deep blues, of ships woven together with pale blue and rose-orange, of lighthouses blinking in an inky night. The amazing thing, she says, is having people respond to her work. "It is always such a surprise that your personal vision, working alone in your studio -- I don't show what I'm working on even to friends -- can move someone. Sometimes people even see more than I can." We have all heard it said that if you go deeply enough into your own creative, spiritual, emotive life, it becomes universal. Merfeld-Campman's work bears witness to, and invigorates, the truth of that adage.